His parents were married in Exeter Cathedral, though both were residents of Moretonhampstead. So did his maternal grandparents, though they lived in Chagford. We do not know whether this was an indication of their social status. William was descended from yeoman stock on both his father and his mother’s side. William senior was a yeoman freeholder. William junior was his oldest son. Soon after his father’s death we find him as a freeholder living at Sainthill. It is highly likely that he had inherited the family farm and that this is where he grew up. 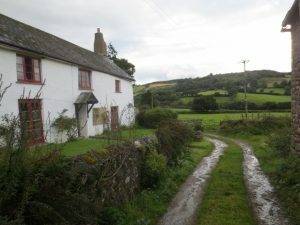 Sainthill Farm lies south of the Moretonhampstead – Whiddon Down road, about a mile and half out of Moreton. William was the oldest of four children. There is a burial for William Taverner in 1736, when William was 15. He is likely to have inherited the farm, but he would have struggled to care for his younger siblings. No doubt his mother played a considerable part in managing Sainthill Farm. This may explain why he did not marry until he was in his thirties. In 1740 Mary Tozer was apprenticed to William Taverner, yeoman. William senior had died in 1736, when the younger William was 16, but Gilbert Taverner was still alive. The fatherless William, son of William, seems thus more likely to have been a yeoman at the young age of 19, inheriting the farm from his father, than another William, son of Gilbert, whose father was still living. In the 1741 list of Devon Freeholders for Moretonhampstead we find William Taverner of Sainthill and William Taverner in Town. The former is likely to be the son of William Taverner, yeoman. He appears again as a freeholder in the 1751 list. Mary’s marriage took place in Moreton. Since she is not stated to be from another parish, we may presume that this was then her home. But there is no record of her being baptised in Moreton. She died in 1814, aged 82. This gives her a birth date around 1732. From 1603, the first year of the surviving Moreton registers, onwards, Peter Longmed had eight children baptised there. But this family does not appear to have stayed in the parish. There is a William Langmeade in the 1642 Protestation Return for Moretonhampstead, a William Langaman who had three children baptised between 1673 and 1682, and a single reference to a child of Richard Langmead in 1685 in the Moretonhampstead registers. Then Oliver Langmead raises another large family from 1743 onwards. It is possible that he is her brother or cousin. A settlement examination for John Nosworthy, blacksmith, says that he was born in Moretonhampstead and apprenticed to Oliver Langmead. When he was 19 he joined the army and served for 35 years. The document is dated 1786, so John would have left his apprenticeship in 1751. This is four years before Mary’s marriage, so it is the Oliver of her generation who was the blacksmith. It may give some clue to the sort of family she came from. In 1748 John Langmead married Sarah Western, and he may be another of this family. An earlier Oliver Langmead’s name appears in a will of 1668 made in Sampford Courtenay. This could be where the Mortonhampstead Langmeads came from. Sampford Courtenay is about 12 miles from Moreton. There are a number of other Langmeads in the Sampford Courtenay records. The name also occurs in Okehampton, Belstone and Spreyton, giving a cluster around Okehampton. This would suggest a possible baptism in Belstone of Mary, daughter of Richard and Charity Langmead on 3 Dec 1734. There is no record of this child dying young or marrying in Belstone. This differs slightly from the age given at her burial, but the ages of older people were not always precisely known. After the Restoration of the monarchy under Charles II in 1660, there was a reaction against Oliver Cromwell’s Commonwealth. The name Oliver went out of fashion. That fact that the Langmeads were using it around 1720 probably means that they, at least, retained Parliamentary and Puritan sympathies. The profusion of William Taverners makes it difficult to determine precisely who is who. The best evidence comes from the naming of their children. In 1740 there is a marriage. Both Williams would have been 19 then, which is untypically young. There follow a succession of baptisms, including a son James, born in 1746, and a daughter Loyalty, who died in 1754 at six months. Her unusual name makes it a near-certainty that the father of this group of children was William, son of Loyalty and Gilbert Taverner. rather than William, son of William and Elizabeth Taverner. There is then another marriage in Moreton. It is reasonable to suppose that this is the son of William Taverner and Elizabeth Ellis. The sequence of births then continues. The closeness of this baptism to William and Mary’s wedding means that this is more likely to be the son of William and Anne. That couple had already had two sons named William, both of whom died shortly after birth. On the other hand, we should expect William and Mary to have a son named William. Susanna was buried on May 2nd, 1765. These could be the children of William and Anne or William and Mary Taverner. If there were two men with the same name fathering children at the same time, a distinguishing detail was often added, such as an occupation or place of residence. But this was not always done, and does not appear to be the case in Moreton then. However, the intervals between births are just what we would expect for one couple. The typical gap between children at this time was 2-3 years. In no case are there two baptisms so close that they could not be children of the same couple, nor is there an overlap of names. At her death, Treleaven’s Diary confirms that Mary Taverner was the mother of Daniel. It seems likely that most, if not all, in this second group of baptisms are the children of William Taverner and Mary Langamead. In particular, the fact that William and Anne already have a son James makes it extremely likely that our James, the younger one, is William and Mary’s son. William and Mary lost only one child in infancy. It is likely that they were not amongst the poorest families. The Universal British Directory of 1791 lists William’s son Daniel as one of six carpenters in Moretonhampstead, under ‘Traders, &c’. This suggests that Daniel had his own business. No other Taverners are listed in this directory. If William was not a yeoman farmer, then it is possible that he was a carpenter and handed on the trade to his son, but he may have apprenticed Daniel to someone else. Daniel became a well-regarded craftsman in Moreton, more so than his younger brother James, who was suspected of misappropriating funds from the toll-gate. A William Taverner continues to appear on the Freeholders List in 1762, 1771 and 1783. The most likely burial for him is that of William Taverner on 30 April 1780, though given the frequency of this name it is impossible to be certain. Tue. Dec. 24th. George Hamlin an Apprentice to Mr. Pinsent, detected by his fellow Apprentice (George Harvey) in stealing candles from his Master, he was immediately taken in Custody, and carried before Justice Roberts at Drewsteignton where he confessed he had frequently been guilty of the same crime, and sold them to William Tavernor and his wife who keep a shop in Court Street. Tavernor and his wife absconded on hearing of Hamlins confession. Fri. Nov. 11th. Died aged 82 Dame Taverner mother of Mr D. Taverner, Carpenter. ‘Dame’ was a courtesy title given to respected older women. Treleaven uses ‘Mr’ more freely than the parish registers, which accord it only to gentlemen. We know from the parish register that the deceased was Mary, and that she was buried three days later. She had been living in the town of Moretonhampstead, and not on an outlying farm. Taverners continued to live at Sainthill until the death of William E. Taverner in 1894. There is a poster for the sale of Lower Sainthill Farm, property of William Taverner, deceased. BMDs from parish registers in DRO and Findmypast. Devon Archives and Local Studies Centre, Bovey Tracey, Overseers of the Poor. 2160 A/PO 723. Discovery.national archives.org.uk.